It's the end of another year, and as I tried to do last year at this time, I'd like to write something that sums up the year, makes a brilliant statement, and shows progress (or something). The usual sort of thing. It doesn't feel quite like "brilliant" this evening, but here goes "something" anyway. In the domain of this blog (which mostly excludes home, family, and work issues, all of which are thankfully going pretty well), 2006 was an interesting year. There were plenty of developments in space, starting from the arrival of Stardust and the departure of New Horizons (pictured in Orbiter above - its target was a planet when it launched but is now called a dwarf planet, though Pluto itself hasn't changed). The arrival of MRO in Mars orbit was another big development, and it is now returning amazing high-resolution imagery of the Red Planet, just as Mars Global Surveyor went off the air after many years of faithful service and zillions of great pictures of the Martian surface (it went out with a bang as signs of very recent liquid water flows were reported based on repeated MGS observations of promising sites). There were also two successful shuttle missions to the ISS, the announcement of NASA's plans for a Moon base, and the good news that a shuttle mission to extend the life of the Hubble Space Telescope was approved. The amazingly long lived Mars Rovers also continue to give us a "local presence" on Mars. A new version of the Orbiter space flight simulator came out in May, and I was on the beta testing team, mainly so I could update my book Go Play In Space to be available when the Orbiter 2006 was released (Andy McSorley made substantial contributions to the second edition). I spent a lot of time expanding and updating the book, and worked with Andy and later also with Mark Paton on an Orbiter add-on based on the book The Rocket Company. Andy, Mark, and I also spent a lot of time this year on Mars for Less (MFL), a human Mars mission plan developed by Grant Bonin. I had the idea to create a "virtual prototype" of MFL in Orbiter, and Andy and Mark agreed to do most of the work to create an Orbiter add-on for MFL. It turned out to be very complex indeed, but it really proved the point that Orbiter could be used as a tool for fairly detailed mission design (including the challenging EDL phase I showed in a recent YouTube video). The original point of the MFL exercise was to write a paper for presentation at the Mars Society Conference in Washington, DC in early August. The paper was accepted and written (co-written with Andy, Mark, and Grant), and I presented it at the conference, which was a real thrill. You can find the paper and the presentation at the main Orbiter web site (under References), and more information on the MFL project at Andy's web site. Part of the reason for my recently increased interest in space and astronomy is related to educational outreach. I think space and astronomy have the power to inspire people of all ages to think positively about science and technology and the future. As many people were, I was inspired by the blog posts of Ms Anousheh Ansari, a self-described private "space ambassador" who visited the ISS this year. She fulfilled her life-long dream and did her best to share her experiences with others through her blog. Although I don't expect to ever go to space myself, I will be a "space ambassador" of sorts starting in 2007 - a JPL Solar System Ambassador, in fact. I will write more about that in the next few weeks, after it's offically announced on JPL's web site (the 2007 ambassadors are not listed there yet). 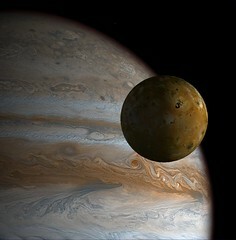 Since Orbiter provides an excellent way to virtually explore the Solar System (as shown in the Orbiter image above, Io with Jupiter), I plan to make extensive use of Orbiter in my presentations, to supplement the materials that JPL will supply. We have seen an abundance of amazing astronomical images this year, and Phil Plait of the Bad Astronomy blog has assembled a great top 10 list so I don't have to. The dramatic composite Cassini image of Saturn eclipsing the Sun was his number one, and it's hard to disagree. It's a beautiful image. I'm taking some vacation time this week and mostly doing a lot of reading. I'd like to say that I'm "catching up on my reading" but because Amazon makes it so easy to order used (and new) books, catching up is not happening! My book stack keeps growing and getting interrupted by new arrivals. So instead of finishing The Survival Imperative (I'll get to it soon! ), I read Sam Harris's instant classic Letter to a Christian Nation, started reading This Is Your Brain on Music ("the science of a human obsession") by Daniel J. Levitin, and also zipped through the scary but true 1995 book The Hot Zone by Richard Preston. The Hot Zone is about ebola and related "hot" viruses that emerged in Africa in the 1970's. It discusses the early human cases and graphically describes the effects of the diseases caused by these "agents," but focuses mostly on the discovery of a strain of ebola that was killing monkeys imported to the US from the Philippines for medical research - in Reston, Virginia! This biohazard emergency was handled by the nearby US Army Medical Institute of Infectious Diseases (USAMRIID) at Fort Detrick, Maryland. Without spoiling it completely for those who may wish to read it, I'll just say that it looked quite bad at first, but turned out to be not quite as bad as it could have been (for humans anyway). It inspired a movie called Outbreak which I've never seen. Aside from being as good a read as any techno- or medical thriller novel, The Hot Zone is also a sort of cautionary tale (Preston also wrote a novel on bioterrorism that was said to have scared the pants off President Clinton when he read it in 1998, prompting him to request government studies that may have helped the government to be somewhat more prepared for the real bio-terror "postal anthrax" emergency in late 2001). HIV , ebola, and SARS are the best known viruses that have crossed over from animals to humans in recent years. There will probably be more (not that we've heard the last from those three). Speaking of cautionary tales, I also read a fascinating essay by scientist and SF author David Brin called "Singularities and Nightmares," a sane and balanced assessment of various future scenarios, good and bad. P.S. In The Hot Zone, researchers went to the Mount Elgon area of western Kenya to try to find the wild reservoir of ebola virus (where the virus resides between sporadic outbreaks in apes and humans). Nothing was found, although spiders, insects, and bats were mentioned as possible hosts, and bats were strongly suspected. In late 2005, fruit bats were identified as likely hosts, though there could still be others. I had been wondering about this and just checked it out. Talk about standing the test of time: Newtonian mechanics continues to be used to accurately predict the behavior of planets, moons, and spacecraft in the Orbiter space flight simulator as well as in computer programs used at JPL and everywhere else in the real world of space operations and astronomy (with minor corrections in some cases from General Relativity). Every time an eclipse is predicted (or a shuttle docks with the ISS for that matter), the mechanics developed by Sir Isaac in the late seventeenth century are proven once again. This one reason why Newton is considered by many to be the greatest figure in the history of science, and since today is his birthday (December 25, 1642 under the old style calendar, January 4, 1643 by modern reckoning), I decided to give him a little salute. I don't actually celebrate Newtonmas as some do, but whatever your personal choice of winter season holiday or other celebration, I hope you have a good one! I just posted a couple of Orbiter videos of my own on YouTube. These are slight re-works of clips I recorded last summer for my presentation of "Virtual prototyping of human Mars missions with the Orbiter space flight simulator" (300k PDF) at the Mars Society Conference in Washington, DC. This paper used the Mars for Less mission concept developed by Grant Bonin as an example, implemented as an Orbiter add-on by Andy McSorley and Mark Paton. I took the 1:50 clip (above) of the final moments of Mars entry, descent, and landing (EDL, brilliantly designed by Mark Paton) and added an excerpt of a pseudo-classical synthesizer recording that I did back in 2002. I called it "Elegy After Vaughan Williams" because the shifting tonality vaguely reminded me of some of Ralph Vaughan Williams' compositions. I knew I'd eventually find something to do with that little musical doodle. The other clip is very brief (0:34) and starts with a close-up of a female astronaut (courtesy of Greg Burch) standing at our spartan Mars base in Vallis Dao, pans around her, then zooms out until Mars is just a pixel. The music is an excerpt from Ravel's Daphnis et Chloé ballet. I used this clip on the title slide of the presentation. As a songwriter, I tend to pay attention to songs with unusual set-ups, story lines, or lyrics. One example I've had stuck in my head the last few days is a song by Fountains of Wayne called "All Kinds of Time," from their excellent 2003 album Welcome Interstate Managers. I like FoW in general - their songs often have unusual points of view and humorous lyrics, as typified by their best known song, the tongue-in-cheek boy's fantasy "Stacy's Mom" (funny video). What I like is that it's an entire song about a single moment, a few seconds at most, describing the point of view of the quarterback whose sense of time flow is slowed down. I guess you'd say he's "in the zone" and entirely focused on completing the play that he has set up. There's no FoW video for this song AFAIK, but not surprisingly, there is an NFL promotional video based on it (I found it on the media page of FoW's web site). It's not the whole song but it's still pretty cool. Here's a video that I learned about from a post in the Orbiter Forum (which I can't reach now due to a problem - I'll add a referral credit later). It's another way to look at the relative sizes of planets and stars, but the gradual zoom-out in this video seems more effective in conveying this than does a single still image or even a series of stills. It really emphasizes the 3D-look of these (mostly) self-illuminating astronomical objects. This video was posted by a number of different people on YouTube and it contains no credits itself, so I don't know who actually created this. If you do, please let me know. Of course there are other "cosmic zoom" movies around including the classic "Powers of Ten" (and the Simpsons version too). If you're really old (like me), you may even recall when "let's get small" was part of a comedy routine. Anybody remember who that was? 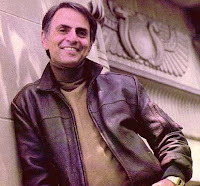 It's hard to believe that Carl Sagan has been gone for ten years. In remembrance of him, a memorial "blog-a-thon" is happening today, and I'd like to add my voice to the chorus. When I was a physics major in Pittsburgh in the early 1970's, I was also working full time on the night shift at a psychiatric hospital, oddly enough. It was normally quiet enough that I could do most of my physics and Russian homework and studying in between my rounds and charting, and sometimes even have time for some extra reading. One book that kept me awake and fascinated for many nights was Intelligent Life In the Universe, a 1966 book by I.S. Shlovskii and a very young Carl Sagan (Sagan greatly expanded a translation of Shlovskii's original book which had been published only in Russian). The scope of this book was amazing - astronomy, astrophysics, biology, evolution, and much more, and it was quite a ride. These were minds that were thinking big and speaking clearly. I had become a physics major because I had an interest in understanding the universe from the most basic level, though I was also very interested in biology, psychology, computer science, languages, and much more. Sagan was showing that it was possible to think and write clearly about how all these things are connected, and of how humans are connected to the universe. Not in a supernatural way, of course - the results of physical laws interacting at so many different scales of space and time provide more than enough wonder for anyone who wishes to look closely at the universe, as Sagan demonstrated in this first book and in the many that followed. So I became a Sagan fan, and through the seventies and beyond, I bought and read every book he wrote. In the nineteen eighties, I was living in Pasadena, California and in 1980-1981 I was writing some book reviews for the LA Weekly. Cosmos was out, so Sagan was very much in the news, and he was also in town for the Voyager encounters with Saturn (I forget whether this was November 1980 for Voyager 1 or August 1981 for Voyager 2). I got the idea to use my minimal LA Weekly "credentials" to try to set up an interview with Sagan. I contacted his publicist but it never worked out - he was just too busy at JPL and too in-demand in general. He didn't especially need coverage in the LA Weekly (I had some angle that I thought was unique, but I guess it wasn't unique enough). Carl Sagan certainly lived those words. No video on this one! I'm still reading Burrows' The Survival Imperative, but I also bought the December issue of The Atlantic for several interesting articles, including one by William Langewiesche that I just finished, "How to Get a Nuclear Bomb" (this link is just a teaser unless you're an Atlantic subscriber, which I'm not any more). The article is an excerpt from an upcoming book, and it is sobering to say the least. The bad news? Plenty, of course, but the big one is that there is a lot of weapons-grade HEU (highly enriched uranium) around, much of it in Russia, and much of it not especially well secured. While getting the necessary ~50 kg needed to make a workshop-built Hiroshima-type bomb would not exactly be a cakewalk, it could probably be done with the help of paid insiders (which is not exactly impossible in Russia). The good news? "Good" is relative of course, but consider plutonium, which is also pretty common stuff in the world. One "good" point is that plutonium is so hard to work with, that this makes up for the fact that you need so much less of it to make a bomb. Not only is plutonium more toxic and radioactive, making a bomb from it requires precision mechanics and explosives. It's quite hard to do in a garage. Another "good" point is that "ready to use" nuclear weapons are generally held more securely by everyone who has them, and they generally require regular maintenance and special codes to activate them. If someone with the will to use one managed to get one, they would probably use it pretty quickly, while it was still "fresh." So the fact that none has blown up anywhere recently suggests that the bad guys don't have them (yet). There's other "good" news too, mostly along the lines of "it's harder than you think," but of course there's also more bad news. Perhaps worst of all is the fact that the whole "deterrence" thing breaks down pretty badly when any of the players is not a nation-state. Even a scary/crazy nation-state like North Korea or Iran has a lot to lose if they actually use a nuclear bomb against someone (or even provide one that can be traced back to them to someone else). Leaders may value their own fancy lives even if they don't value the lives of others (including their own people). But parties who lack an identifiable "home field" don't offer any sort of infrastructure to threaten with retaliation. By the way, none of this information is news to anyone (friendly or otherwise) who cares about this stuff. It's all out there. OK, not too cheery. I say, let's get busy on those space elevators, private space stations, and colonies on the Moon and Mars. We need a backup! Over at the Orbiter forums I noticed yet another YouTube video that I feel compelled to show here because it's about Orbiter (I promise I will not include a video in every post - this is just the new toy effect). This 4:42 video by "texasf1racer" uses mainly the "shuttle fleet" Discovery add-on and shows excerpts of a space shuttle mission from launch to re-entry and landing, complete with NASA radio calls and a musical soundtrack. You get to experience something of the "feeling" of Orbiter in this video, with beautiful shots of the Earth from low orbit, though you should keep in mind that Orbiter offers much more than you can show in a 5 minute video. There are other spacecraft and planets, and even the shuttles offer more than shown here - rendezvous & docking with the ISS (Discovery is briefly shown docked at the ISS), payload deployment, EVA simulation, etc. But if you're wondering what Orbiter is like, this gives you a pretty good idea. Nice job! Of course this is not the only Orbiter video on YouTube - search for "orbiter simulator" and you can find a lot more, including some tutorials. This one by "VIRTUALROUTES" is especially nice - it's short (2:25), uses the opening Zarathustra theme from the 2001 movie, and shows various spacecraft (including Apollo) and planets (Jupiter, Mars, Saturn, Earth) and their moons. This one is longer (6:00) but has a cool Asian-flavor new-age sound track; it's another texasf1racer production. I don't want to wear out this YouTube video thing, but the scope of what's out there is really amazing, and not just for funny stuff. The brief (4:42) video shown here was created by the Spitzer Science Center at Caltech and is part of a video clip series available at their own web site, though it seems to require a download there, while the YouTube version starts playing immediately. This of course is part of the appeal of YouTube - immediate video gratification, whether you seek clips of Borat or explanations of infrared astronomy used to observe temperature differences on the surface of an extrasolar planet as in this case. P.S. The Spitzer IR telescope is not as well known as the Hubble, but it has produced some equally stunning images. Check out this gallery of zoomable images. Well it seemed to work in preview mode, except for a big red warning message from Blogger. I guess I'll try publishing and see what happens. This "Mars 2020: Springtime" video is pretty funny. I now believe there is life on Mars. I was surprised and flattered to learn today that I am Time magazine's Person of the Year for 2006. Well, not me exactly. Actually it was "you" - defined as "anyone using or creating content on the World Wide Web." So we're both in - nice job! And I say better me (and you) than Iranian President Mahmoud Ahmadinejad who apparently was the first runner up. I guess he still gets it if we are unable to serve, so let's watch the partying, lest we be dethroned like Miss USA (looks like she wasn't dethroned after all - imagine my relief!). Damn Interesting is certainly damn interesting sometimes. Case in point from the other day: this article on the Daedalus starship, designed in 1973 and still cool. It reminded me that my space and astronomy book collection includes nothing on interstellar flight and starships, so I ordered a copy of Centauri Dreams by Paul Gilster, who also writes an interesting blog of the same name. He wrote about project Daedalus just yesterday. I'm reading my latest impulse buy (triggered this time by a 40% email coupon from Borders Books - yes, I am a marketer's dream). The book is the recent The Survival Imperative: Using Space to Protect Earth by William E. Burrows. I'll be writing about this important book in the next day or so. I bought a Garmin StreetPilot i5 GPS for my daughter, and of course I first had to set it up and test it for her (for about a week). This had the same inevitable effect as when I try almost any food item at the sample table of Trader Joe's - I try, I buy (see above). My GPS will be here Tuesday. It's way cooler than the 1999-era Magellan 315 camping/boating GPS that I use for navigational backup when I fly (more accurately, flew) little airplanes. I'm also surprised that I am writing about three or more subjects in one post and not including a single picture. There are some great ones in that Starship Daedalus site that I really wanted to use. Wikis are a very powerful and interesting web development for the collaborative collection and sharing of information. The 900 pound gorilla of wikis (1,534,606 articles in English today!) has to be Wikipedia, which never ceases to amaze me. 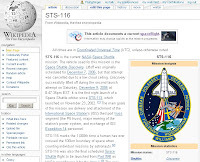 Case in point: the detailed and illustrated article on STS-116, the still ongoing space shuttle mission! There are even notes on day 5 of Discovery's mission (today). While there is no shortage of web sites with information on NASA missions (including NASA's own), the point is that you can find almost anything in Wikipedia, in a standardized format, usually with many links and references. Of course Wikipedia isn't the only wiki - there are many of them, including a wiki devoted to the Orbiter space flight simulator, orbiterwiki.org. I've heard about this wiki for some time but visited it for the first time today (linked from the Wikipedia article on Orbiter, which I was editing), and it has a lot of interesting, useful, and easily accessible content. I found Robert Gendler's astrophotography web site through today's APOD, which is a very nice view of NGC 1055 and M77 by him. 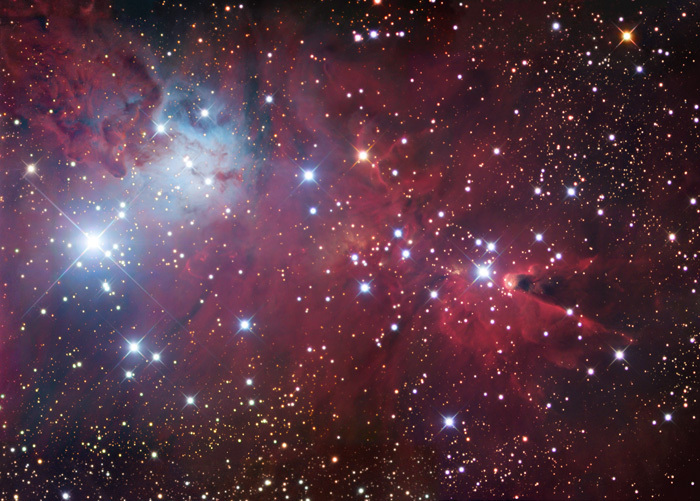 His web site has an amazing collection of photos and mosaics of nebulae (Cone Nebula mosaic shown here), galaxies, and other astronomical subjects, as well as some great photos of terrestrial subjects (especially his superb Grand Canyon Mosaics). I really like my iPod Nano (I know, everybody does). One thing I like about it is the rating system, which I'm using to figure out what music I really like. I started with around 980 songs, chosen fairly quickly from the 8000 or so on my home PC. So this was my "optimization starting point," hardly random to begin with, but subject to further "selection pressure" from the 5-star rating system. I rate the songs and remove the "weak" ones each week to make room for new music. Starting from the bottom, I use one star to mean "delete" (next time I'm in iTunes). Two stars is a song that's OK and I might like to hear occasionally, though I might delete it if I need the space. Three is a good song that I'm happy to hear occasionally. Four stars is a really good song that I'm ready to hear any time, and five is basically the same, but also "undeniable" (truly awesome, classic, or both - or one of my own songs, some of which are fives to me at least!). I usually apply these ratings while listening, basically the only "input" allowed while listening to a song on the iPod (I can edit general information or delete songs only when plugged into a PC with iTunes). With this system, I've so far rated 411 of the 977 songs currently on the iPod, with 131 of those getting five stars (copy/paste into Excel helps with this vital analysis). Some of my five star artists are Aimee Mann, Badfinger, Bare Naked Ladies, the Beatles, Billy Joel, and Bright Eyes. Scrolling to the end of the fives, I see Simon & Garfunkel, Sir Neville Marriner (for a Mozart piece), Stevie Wonder, Sting, Trisha Yearwood, U2, and Van Morrison. Just thought you'd want to know. OK, you didn't, but I did. This picture is so cool. It was the Astronomy Picture of the Day for October 17, 2006 which I just happened to see on the way to something else. 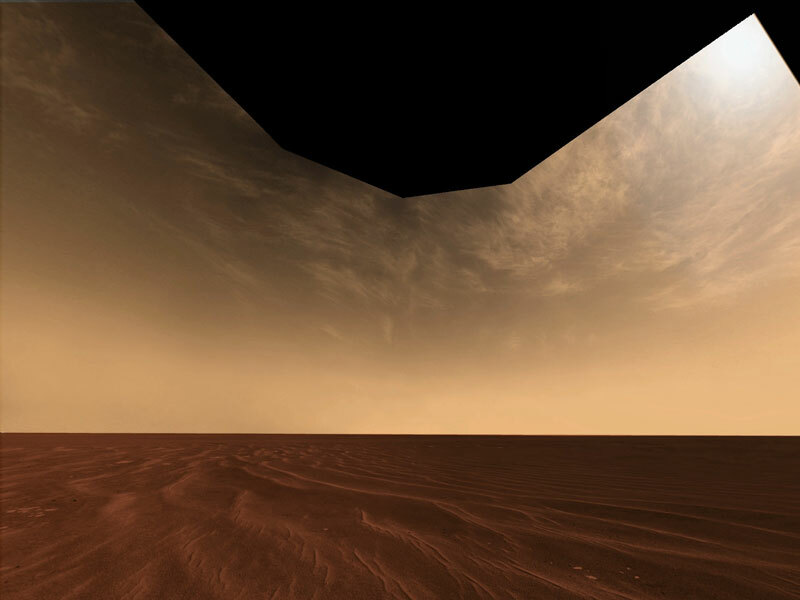 It was taken by the the Mars rover Opportunity, posted with the title "Clouds and Sand on the Horizon of Mars." Color is exaggerated in this image. My friend Peter "MiGMan" Inglis is a multitalented guy. In addition to being a professional classical guitarist (his Whole Guitarist web site is great) and author (Guitar Playing and How It Works), he's a flight simulation expert. For years he's been channeling his knowledge and enthusiasm for this subject into an amazing web site, MiGMan's Flight Simulation Museum. If you like airplanes, you will really enjoy exploring this site. Recently MiGMan was invited to share his flight sim expertise with a much wider audience on the ABC Australia television show Good Game, where he talked about the joys of flight simming and gave a brief "master class" on the key points of takeoffs, aerial combat, and landing. Visit the museum to learn more and to view a nice streaming video (WMV) of his flight sim segment on Good Game. Excellent stuff! I had the pleasure of watching (via NASA TV) the dramatic Saturday night launch of Discovery with a group of other astronomy- and space-minded people, members of the Aldrich Astronomical Society, of which I am a new member. Before the launch, I met and talked with some other members of the club, showed off some simulated shuttle activities in Orbiter, and had a look at the Orion nebula through one of the club's telescopes. Aldrich has been supporting amateur astronomers and educational outreach in Central Massachusetts since 1932. Discovery of course made it to orbit without a hitch, and I just watched the last few minutes of its docking with the International Space Station on NASA TV. Very smooth all the way. I've just had a look at two of Virgin Galactic's promotional videos for their planned commercial space flights. It may be "only" suborbital, but wow, it is going to be incredibly cool. The first video is accessed from the ""view the movie" link on the main VG web page. It is mostly Richard Branson talking about the program, with clips of SpaceShipOne's X-Prize-winning flights and interviews with the test pilots (and a lot of emphasis on safety). There's some other really great content on the VG web site - after all, they are trying to sell you on a $200,000 product! You can download a 38 page PDF brochure for offline viewing and printing. The other video is a computer animated movie that shows the entire SpaceShipTwo flight sequence. This is really the coolest part of all - it's very well done and makes it seem incredibly real and exciting. Test flights are supposed to start in late 2007 with commercial flights starting about a year later if all goes well. This is a story that's showing up pretty big even in the mainstream media - signs of possible recent water flows on Mars. When talking about Mars, "recent" usually means "the last 300 or 400 million years" - but in this case, the changes are seen over the last seven years! 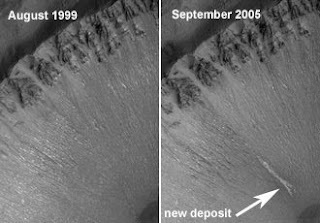 Before NASA lost contact with Mars Global Surveyor (MGS), it was used to revisit hundreds of previously imaged high-slope gully areas in 2004 and 2005. Researchers then looked for changes between the old and new images and found some that are strongly suggestive of brief flows of liquid water (possibly from an underground geothermal source like a geyser). Coloration and other features suggest that these are liquid-based flows rather than shifting dust or debris. Pretty amazing stuff. The findings will appear in Friday's issue of the journal Science. Does this increase the chances of finding life of some sort on Mars? That's what everybody thinks, hopes, wonders, or imagines. I suppose it makes it more plausible if not more likely. It would sure make Mars a more hospitable place for future human settlers. It's too bad that MGS went off line just before this big announcement, but the good news is that MRO is now in orbit and has just started its science phase, with even higher resolution instruments than the ones MGS used to make these observations. I've been busy with work and preparing for an astronomy/space school event this Friday, so not much blogging time. There's lots of space news you can read about elsewhere of course - more details on NASA's Moon plans, Mars Reconnaissance Orbiter's imaging of the two Vikings and the Spirit rover, and the impending launch of STS-116. Cool stuff. No time. But here's a quick flight related story - the USS Intrepid briefly takes to the water (towed to a New Jersey drydock for refurbishing). Intrepid is normally docked at Pier 86 in New York City, where it houses an excellent air and space museum. 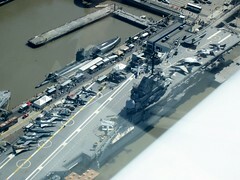 I love aircraft carriers, airplanes, and aviation history, and I visited the Intrepid museum several years ago. Then last April (2005) I had the good fortune to go along on a weekend outing with the Worcester Pilots Association, flying the Hudson River VFR Corridor at an altitude of 900 feet above the river. We flew down on the New Jersey side (passing the Statue of Liberty), turned around over the bay, then flew up the Manhattan side, passing close to the Intrepid. I interrupted looking for traffic and talking on the radio to take a few pictures, including the one shown here. I posted a couple of others on Flickr. Real "Music of the Spheres"
I was looking through my space and astronomy books tonight, picking out some books to display at a middle school "star party" event I'm helping out with next week. 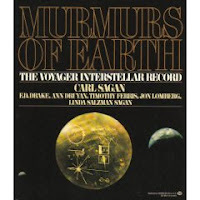 I came across a book I hadn't looked at in a long time, Murmurs of Earth: The Voyager Interstellar Record, originally published in 1978. This book was written by Carl Sagan and several other people who were involved in the project to develop a "record of Earth" that could be attached to the two Voyager spacecraft that were launched in 1977 to visit Jupiter and Saturn (and ultimately Uranus and Neptune as well, in the case of Voyager 2). The "golden record" that was attached to both spacecraft contained a variety of information encoded on a gold-plated audio-video disc, with visual instructions for playing back the disc in the unlikely event that the spacecraft is recovered by some distant civilization. Distant civilization? Was this even possible? Yes, in theory, because the Voyagers were planned to be the first human-made objects that would leave the solar system and enter interstellar space, with Voyager 1 now having just left the "heliosphere" in 2004. It will take thousands of years or more for either spacecraft to reach any star system, but if one were recovered by someone in the far future, the mission designers wanted to include some sort of message about who its makers were and where this odd artifact came from. Of course the Voyager record is really more of a message to (and from) the people of Earth, so a lot of thought went into what should be included to represent as much of humanity's heritage as possible - samples of many languages, photos and diagrams, sounds and music. The book Murmurs of Earth is a detailed telling of what was included and how it was all decided and compiled. It's still a very cool book, and it includes all the images that were on the record. Some later editions of the book also included a CD-ROM with the actual contents of the "golden disc," but my 1978 first edition hardcover did not have this. All versions of the book are now out of print, but many used copies are available through Amazon and other sources. Unfortunately none of them seems to include the CD-ROM, but as you might expect, much of the information that was on that disc is now on the Web. JPL has a web site devoted to the Voyagers, and a section of this site is devoted to the Golden Record itself. There you can find links to many of the images on the record, and most of the sound samples (though none of the music, probably due to performance copyright issues). Kepler's concept was realized on a computer at Bell Telephone Laboratories by composer Laurie Spiegel in collaboration with Yale professors John Rogers and Willie Ruff. Each frequency represents a planet; the highest pitch represents the motion of Mercury around the Sun as seen from Earth; the lowest frequency represents Jupiter's orbital motion. Inner planets circle the Sun more swiftly than the outer planets. The particular segment that appears on the record corresponds to very roughly a century of planetary motion. Kepler was enamored of a literal "music of the spheres," and I think he would have loved their haunting representation here. How appropriate for the sphere-trotting Voyagers and for this particular blog! P.S. 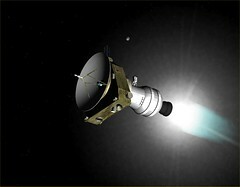 Although Pioneer 10 and Pioneer 11 were launched earlier and are also departing the solar system, Voyager 1 "caught up and passed" these spacecraft in terms of distance from the Sun and reached a distance of 100 AU (astronomical units, i.e., 100 times Earth's average orbital distance from the Sun) in August 2006, and is now in a region called the heliosheath, a zone where the sun's influence is very weak, though this is still not considered "interstellar space" (that will take about 10 more years). This seems to be the week for educational posts, and as they say on Monty Python, "now for something completely different" - a book about optics. I was just reminded of this by a caller who wanted to know about educational resources related to optics (triggered by my own Optics for Kids web site). I mentioned the book Light Action! (subtitled "Amazing Experiments with Optics," by Vicki Cobb and Josh Cobb, with illustrations by Theo Cobb). 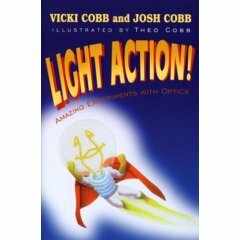 This book features a series of simple but enlightening experiments with light, using household materials such as flashlights, water, ice cubes, sunglasses, and TV remote controls. The experiments are easy to do and are followed by clear "here's what's happening" explanations of the optics involved. This delightful 1993 science book for grades 6 and up went out of print some years ago, but I just checked Amazon and found that it's back in print, in a 2005 paperback edition from SPIE Press (SPIE is the optical engineering professional society).